These back-and-forth Easter egg drawings are simple, fun, and interactive for kids. They combine two of our favorite family art games with an Easter theme. These Easter egg drawings are simple, fun, and interactive. Plus the end results are so pretty! Basically, what you do is start by drawing a large Easter egg on a sheet of paper. Then one person adds a band of decoration to the top of the Easter egg with their drawing tool. Pass the drawing to the second person, who chooses a different color and draws another band of decoration below the first. Pass the drawing back to the first person, who picks another color and draws the next band of decoration. 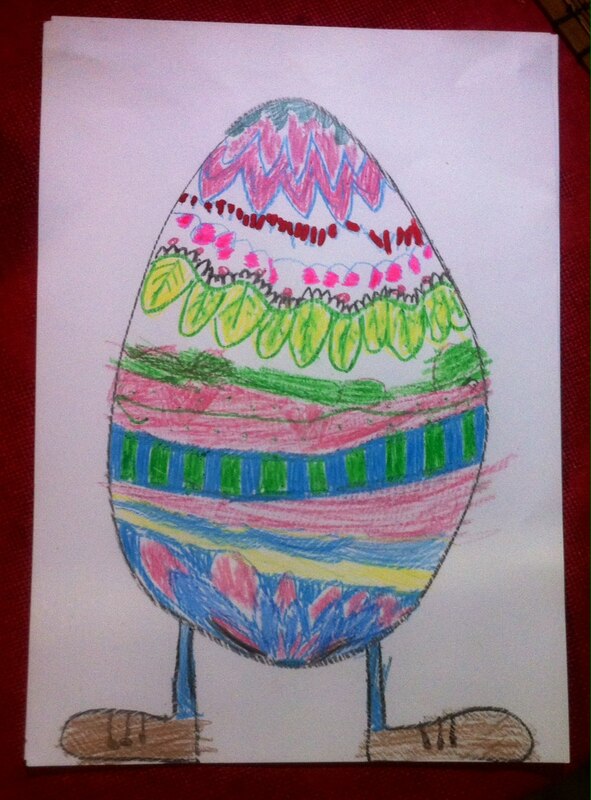 A back-and-forth Easter egg drawing with the 4yo… A fun day-before-Easter art activity! Continue to go back and forth between the two people until the Easter egg is completely decorated. We’ve done this quite a bit, at home and out waiting at restaurants and in the car. We’ve done it with markers in sketchbooks and with oil pastels and watercolors on watercolor paper (as in these photos). You can also have a couple of Easter egg drawings going back and forth at the same time so each person always has one to work on. Or, if you have more than two people, you can go around in a circle. Have everyone pass their drawing to the person on the left, for example, after adding your decoration. 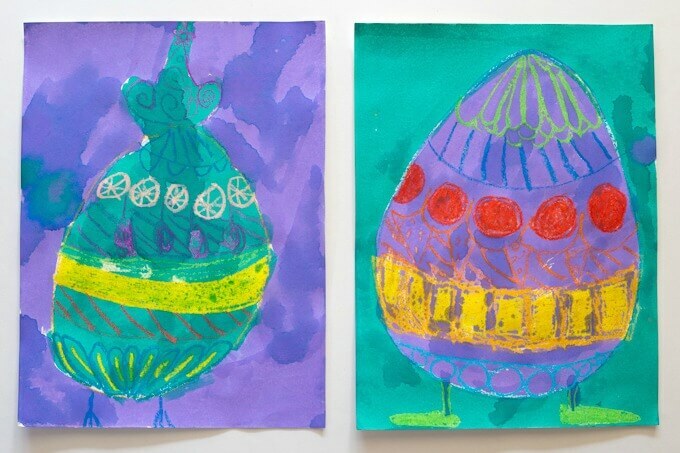 You can take any art activity or technique that you like, such as printmaking, painting, or drawing, and make it an Easter art activity by using Easter themes and colors. What an easy and fun idea. Thank you! these are so cute, and fun I have heard of this bak and forth drawing bit super fun and really makes their collaborations that much more special! Glad you like this, Kate!